Kata of Bujinkan Budo Taijustu and Ninjutsu! I think his video is of Jacks great quality. Has lots of the basics! Get it! Take a look at the NEW video section! This site is a research project. I am not an expert on this subject, just a student. I have collected information about the Bujinkan Ryuha systems from all over the net and from other students and compiled it here for review. Note if it looks like you wrote it then you probably did; thanks for all the info! Please send your name to me if I forgot to give you credit. Let me know if I have made a mistake or if you have information that will fill in the blanks! I hope to build a complete and accurate list of all the ryuha's katas with English translations to all of the Katas names and entertain a few kids. Hope you enjoy this site and find it helpful in your journey through the Bujinkan maze. Register You must register to get class or seminar information. Some links to great resources for ninja. Ninja Book Store Buy Books Here! Underground world of Ninja Warez , Secrets, and free stuff. Weapons and Tools of the Bujinkan with ideas for making them at home. 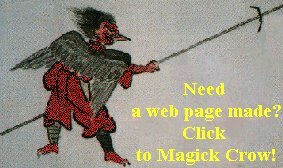 LINKS: Web guide to other great ninja sites and a guest book for you to post your links and e-mail. Want to be safe traveling in other countries? Have good eyes? Read everything at Ura & Omote !